Green ICT Standard organizing it’s 3rd version with i-week16, a member of UNFCCC. The workshop will deliver topics torawrds Green Technology and it’s applications in alignment with COP22 which shall be held in Marrakech. 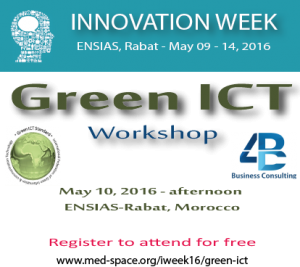 The workshop will discuss cutting edge technologies and approaches to enhance the living style with the industry of green ICT. “500$ worth of Free Green IT Professional Certification examination for the best original article oriented to Green ICT”.